BE ADVISED: I AM NOT ACCEPTING ORDERS FOR CUSTOM FRAME WORK AT THIS TIME. BUT I AM ACCEPTING SLIDES FOR PRO-SIGHT INSTALLATIONS AND SIGHT-INS. ABOVE: This Gen 3 Glock 20 Features a STIP-TEX "FLAT WRAP COMBO JOB" (i.e., Flattened Front Strap Wrapped around into the Side Panels) and "Panel Fill" on the Back Strap; Double Hi-Grip Cuts, Dust Cover STIP-TEX on Memory and Pro-Sights. Cost of this Package? P.O.R. ABOVE: This Gen 4 Glock 27 Features a STIP-TEX "FLAT WRAP COMBO JOB" (i.e., Flattened Front Strap with STIP-TEX Wrapped around onto Side Panels) and a "Panel Fill" on the Back Strap; Beveled Mag Well and Hi-Grip Cut. Cost of this Package: P.O.R. 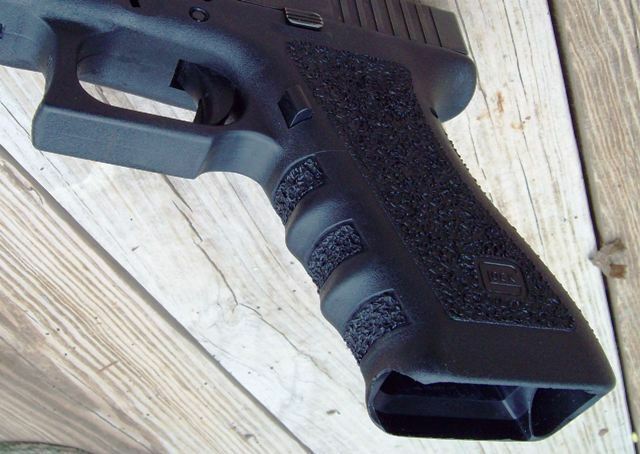 ABOVE: This Gen 4 Glock 19 features a STIP-TEX "PANEL FILL JOB" with Hi-Grip Cut and Rounded Trigger Guard. Cost of this Package: P.O.R. 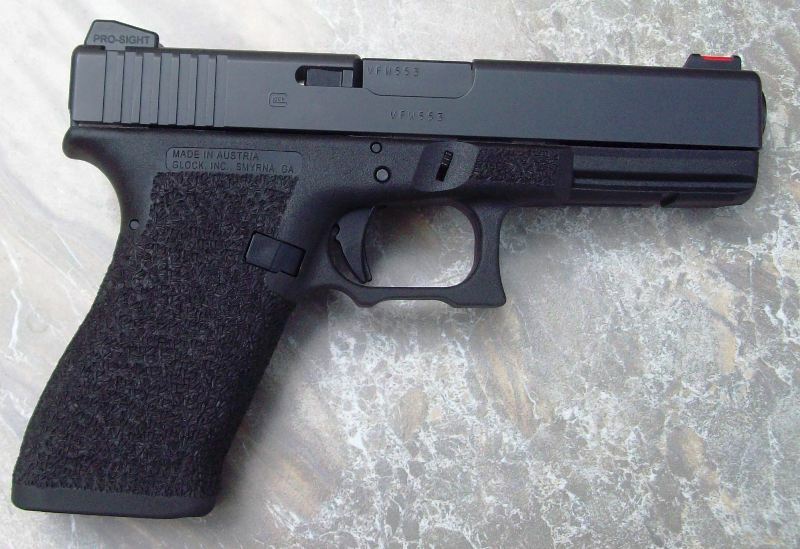 ABOVE: This Gen 3 Glock 19 sports a "FLAT WRAP COMBO" (i.e., a Flattened Front Strap and Side Grip Panels with a "Panel Fill" on Flat Back Strap); Double Hi-Grip Cuts; Ergo Roller Mag Release Button; Extended Slide Release and Smooth Face OEM Trigger. Cost of this Package: P.O.R. ABOVE: This Gen 3 Glock 19 features a "PANEL FILL JOB" (i.e., ALL Panels Filled); Flattened Back Strap; Double Hi-Grip Cuts; Mag Button Scallop Cut and Smooth Face OEM Trigger. Cost of this Package: P.O.R. 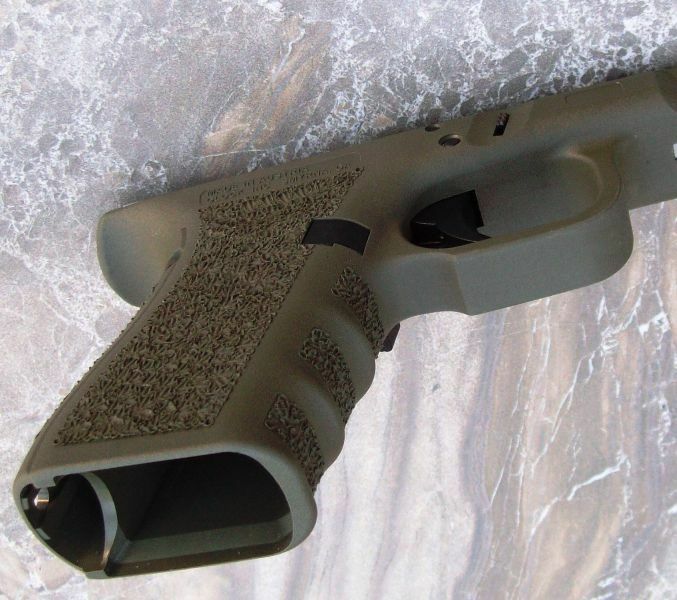 ABOVE: A GEN 4 Glock 17 Frame with a G1917 GRIP CHOP JOB sporting a "FLAT WRAP" (i.e., Flat Front Strap and Side Panels) with "PANEL FILL" on the Backstrap; Mag Well Bevel; Hi Grip Cut. BELOW: A Glock 43 with 360 LOW-WRAP STIP-TEX; Hi-Grip Cut and Mag Well Beveling. Cost of this Package: P.O.R.. ABOVE and BELOW: A Gen 3 Glock 17 "PANEL FILL" STIP-TEX JOB (i.e., ALL Panels Filled) with High Grip Cut and ERGO (Extended and Rounded) Mag Release Button. Cost of this Package: P.O.R.